"Jim gave us a very clear understanding of the training techniques. We immediately noticed that our dog was a lot more relaxed and calm as he responded to the Bark Buster method. We were pleased that the techniques do not rely on treats or bark collars, and that they not only help our dog, but us as well. All in all, very helpful and very professional." I received great info on why my dogs are acting the way they do and what is needed to help them become the happy dogs they are meant to be.I saw an immediate response to jumping (my grandkids came over at end) and Rusty behaved like he hasn't before. I must admit I got so much info on exercises to do with him, I forgot what they all were but the materials re-explained them (thank goodness) and the ability to call the trainer for added info has already been used. Charlie is like a whole different dog. He's calm,he sits at our feet to be picked up and the barking is very minimal. Some days not at all.We are Very satisfied. Jim took the time to listen to me and let me explain our situation.It is complicated.He was a tremendous help.We still have a way to go, but I saw a difference in just 24 hours. I wish I found Bark Busters earlier. So nice to know Jim is so available to us. I have a lot less anxieties myself knowing my baby isn't so anxious. Love Bark Busters !! We've been very happy with the changes we've seen in Artemis. His behaviors were unacceptable and the trainings we tried previously weren't much help.Artemis would bark and sometimes nip at guests, taking him for a walk was a nightmare due to his pulling, and he'd even bark at us when we weren't doing what he wanted:He definitely had us trained. We were very stressed about managing him, but now he's a much better behaved member of the family and we know how to manage his behaviors and he's improving to the point that he's well behaved with fewer and fewer corrections necessary. While we've had a few weeks where we've lapsed on our daily trainings, we're well on our way to where we want to be. Thanks Jim! Jim was very knowledgeable and overall amazing. We are beyond excited to see a change in our dogs and to build a better relationship with them. Very helpful techniques which actually work! 80% improvement in 1 month. Relief and assurance that I can keep my dog! Improvement seen in all three dogs after 3 days. 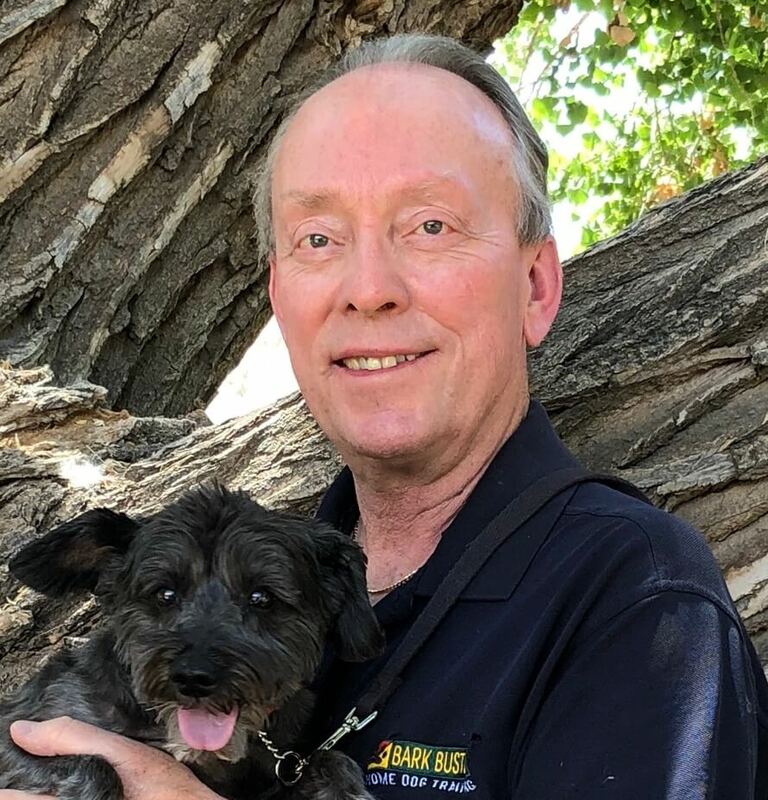 Jim's advice and training techniques have proved to be invaluable.My home life with my dogs is much more peaceful and they are happier dogs. Before Bark Busters all three dogs were constantly competing for attention which led to chaos and fighting. I will continue to practice the techniques making me a better dog owner and pack leader. Jim answered each of my questions thoroughly in an easy understandable and tangible manner.Within the first visit I have noticed a change in my dog's behavior. I feel confident with the methods Jim shared with me to be effective in training my fearful dog Buddy. Thanks Jim ! We want to make sure we create a positive relationship and environment with our dogs. Jim was great in providing tons of information in a way that was easy to understand and practice. I'm sure all of what we learned will lead to a great experience for us all. Buddy is already responding. Today he walked almost entirely with a loose leash, at my side! The vocal correction is working also-stopped barking at workers and people coming to the door. Really gave us a lot of helpful information. Gave us a clear picture of why we do what he told us to do which allowed us to work with Bobby in any situation. Bobby has really bad separation anxiety , but is definitely improving. Thanks SO much! Jim worked wonders with my dog Charly in just two days! He gave me great techniques and tools to aid Charly in overcoming jumping , barking, and some major separation anxiety. Would definitely recommend to family and friends! The dogs responded quickly to the training and it's made a huge impact on everything. My roommate's dogs have also improved immensely, especially her jack russell with recall. Couldn't be happier! The concepts are fascinating and by in large seem to be working. We liked Jim's approach to training and found him extremely informative about dog psychology and appropriate human interaction (as well as inappropriate interaction). We selected Bark Busters because they were coming to our home to spend time getting to know us, our dogs, and the way we interacted. Jim listened to all of our questions and responded to all of our concerns. It was an excellent experience. Great. Jim is a well educated man with his job. Jim is amazing. The method is so doable. I have already recommended Bark Busters to three families. The training was very clear and going through the examples really helped to "solidify" things.Both of our dogs seemed to catch on quite quickly. We appreciate how non-violent the training is! Learning these techniques show us how untrained many of our friends' and families' dogs are. We were given a lot of information on how to correct problems, and new ideas that we didn't even hear of on the internet or other sources. Puppy seems to be learning and responding better.He is still a puppy so we have to be patient. The trainer helped us understand how to communicate effectively with our dog. We thought it was mainly the puppy but realized we were sending mixed signals. Great info. Will probably need a review . Lot's to absorb. Jim is very knowledgeable. Looking forward to more sessions. Jim was very knowledgeable and explained everything very clearly. I could tell my dogs were responding well to the corrections. I really like the training philosophy and lifetime support aspect. I learned a lot of new material and reinforced some things I had already implemented. Good initial session Jim. I appreciate your patient and kind approach. Cow was very responsive to the training, I'm amazed! The training techniques are fun for me and Cow seems calm afterwards.I wish I had done this sooner. Everything we were taught made sense! We are excited about this new technique. Jim is a really great trainer and had a lot of tips/hints for us. He came highly recommended to us and now we know why. Jim did a great job in introducing us to Bark Buster techniques with explanations and examples.He answered our questions without hesitation. Overall we are satisfied and are looking forward to working with Jim, a pleasant and down-to-earth gentleman. Trainer was very confident about training techniques which in turn made me feel confident. I'm not sure how frequently he deals with spouses who differ in their ideas of training , but he was very empathetic and convincing with our "difference of opinion". Jim did an excellent job tailoring the training to the needs of our dog. Great explanations and practical approach to getting us where we need to be in developing the right relationship- Very much appreciated! The 3 hour session went by very fast. It was fun and entertaining with lots of hands on, and best of all I could see instant results with my dog! I wanted to thank you for all that you have done to help us.Know that we will continue to do the work to help her feel safe and protected. Be well and thank you again for your wonderful philosophy! Jim is well spoken and thorough in his explanations and demonstrations. We are so pleased with the progress after just one session! I loved his demeanor. He was personable and I could tell he loved his work.I felt like a lead canine when we finished for the day! Definitely saw results by the end of the training. We always recommend Bark Busters to friends and neighbors. Jim did an excellent job of educating and training. Clear instructions and very knowledgeable as well. Jim was very thorough with all of his directions.We were excited to begin the training. They are good effective techniques.We have begun to see the improvements in our beloved pet's behavior. When Jim Landers came to my home I had already been onetime to the ER and one visit to my doctor with dog bites and scratches that were so bad they had become infected.Since Jim worked with her I have not been bitten or scratched. I now have a normal puppy. Thank you Bark Busters. I have my life back and a great dog! As Jim explained the techniques, they made a lot of sense in terms of why they work.We absolutely love the program!! As soon as Jim left I made phone calls and facebook posts to recommend Bark Busters. We received much more useful information Bark Busters than from other training programs. It is less hands on than I expected but it is working. Jim spent a good deal of time to ensure that we understood the training techniques.He provided insight into canine communication and behavior. We like the "hands off" approach.This seems to be a very good approach to dog training. It was nice knowing that we just need to beef up what we were already doing.Our dogs had been stressing us out. It felt initially that we weren't making any headway. That changed after a few rounds of training. We noticed results.It felt great when we saw real change with our male.We are so happy that we stuck with the program. Thank you for helping us. Jim took his time with us. We were not rushed or hurried along.He used very clear language and examples. as a result we already feel differently about how our dogs behave and how we treat trhem. Jim gave us a very clear understanding of the training techniques. We immediately noticed that our dog was a lot more relaxed and calm as he responded to the Bark Buster method. We were pleased that the techniques do not rely on treats or bark collars, and that they not only help our dog, but us as well. All in all, very helpful and very professional. Definitely saw results after one day of training. So far have seen tremendous improvement in a very short period of time. It's been a week. Sam and I met 3 dogs about her size today and she was fine with them! No growling! Very satisfied. The trainer was very understandable. Noticeable results the next day, using the techniques that I was taught. I sure hope I can implement all of the great advice! The training was very interesting and fun!! We noticed results as soon as Jim entered our home. we're on the first day of training and see a world of difference in our dogs. Such a different way of training and working with my girls! Very interesting and enjoyable training experience. I have already recommended Bark Busters to two coworkers. My dogs need a lot of work, but I am very hopeful. Thank you Jim! Normally our dogs would have been demanding our attention with a visitor in our house , but as Jim guided us through the training they were quite content laying at our feet. Thank you Jim. Very professional, caring and patient toward our dogs.Noticed immediate results with the puppy, and with the older dogs the next day as we repeated the techniques! Very easy to follow, with effective techniques. It's up to me now.Jim was very helpful and made me feel that I can get this to work. Wow, after the first day Lacie already caught on ! We are certain that we are one of Jim's most difficult clients. However his patient approach and willingness to move at a slower pace has worked well. Trainer used verbal and written teaching methods. Our new pup is so well behaved now.I like the "pack"approach.I will recommend Bark Busters in a heartbeat. Training our dogs made me realize how well they are doing and how badly behaved our family's dogs are. They need Bark Busters. It was a satisfying experience to have some simple , useful and successful techniques after just one session. Immediately, when using these tactics my dog's behavior changed for the better. We didn't know what to expect and we were pleased with the results. Clear and concise. An obvious professional. Precious is doing great. When we travel she does extremely well, from road trips to camping.When we first met Jim and Lorie we were kind of afraid of Precious. We used to call her mini Kujo. I can't believe that she has really calmed down and is as cute as she can be.Thank you Jim and Lorie for getting us through the rough times with her. Jim was excellent. We liked the way he was very patient with us and answered all of our questions! very pleased with the techniques. No negative training;we like that!We are very lucky to have found Bark Busters and Jim to be our trainer! Can't wait for more! Mr Landers is very thorough and patient. We're excited for this process. Jim answered all of my questions and concerns. We've seen improvement when I show that I am in charge. I got to learn new things that I would never have thought of.We were very satisfied with the trainer and with the tips he gave us to use.It was worth the money to get help for us and our pet. Thanks! Jim did an excellent job. I learned valuable information and my dogs even started behaving better by the end of the first visit. Jim patiently answered our questions, even when we interrupted him. We saw noticeable results right away. I am happy to get away from the "pinch"collar. The flip chart was great for our sons. It gave them a visual to focus on rather than just having to listen.We were surprised and excited to see how easy and fast our puppies responded to the techniques we were taught. Jim makes it very easy for our whole family to participate in the training sessions. We are very pleased with the training we have received: it is really working! We have recommended Bark Busters to several friends. I like the "philosophy" of Bark Busters. The trainer is very knowledgeable and patient. I have three very different and rowdy dogs.I sure wish I had called Bark Busters the first time I saw their brochure and not wasted my money on other trainers. Jim used my experiences to help me relate to the training concepts. He understood everything I was saying and he was fun. Bark Busters use techniques that dogs easily understand and they are gentle.The techniques are great. We are pleased with the great response from our dog. She has improved every day.I have gained an awesome amount of confidence in just a few days and my relationship with my dog is happier than I expected! The trainer provided specific insight into our issues. Family and friends have already commented on the change they have noticed.The dogs have responded well. Jim was very patient and knowledgeable. Bubba responded to the very first correction. We learned a lot and particularly like the natural training techniques. Jim opened our eyes to see why our previous approach was not working,and how to begin to understand how dogs think.Outside barking and leash manners improved within minutes.We are very excited about not using goodies or "prong collars". This is what we have been looking for in effective dog training. Thank you! After only a few days I noticed a big change in how my dogs behave. We have lived with Venus for the last 8 years and walking has always been a struggle. After one lesson she is like a different dog, walking on the leash nicely. The trainer was very calm. The dogs remained relaxed around him and we have 5 very nervous rescue dogs. Jim has a calm energy that my dogs responded very well to. Bark Busters has created a noticeable difference in our dogs after one visit! I can't wait to practice these techniques on my own. Jim was great! Very knowledgeable with his experience and methods.Easy commands with great results! The techniques weren't abrupt. I liked that the best. This technique showed me that I don't have to be loud with commands to make my pet react. We had fun! The girls were exhausted. They worked hard and so did we!We enjoyed Jim's direction and technique. He explained the methods in a way that made them easy to follow with quick results. We would like you to know how grateful we are for the care and direction you have provided to us very generously.We have continued to use the thought processes and commands that you taught us. She has come a long way, settling in very well and knows her place is with us.Thank you for your efforts and please know how very much your efforts are appreciated. I especially like Bark Busters because it is a gentle way to train my dogs. Thank you so much for the time and knowledge you shared with me and my dogs. All the dogs responded right away. We are all a bit happier now. I've told everyone how great you were. Jim worked miracles with me!I have 2 new dogs! I like the combination of the visual and written materials in addition to the hands on experience.Very pleased with the changes in behavior. Amazing!I look forward to many positive results. Trainers were very helpful and didn't make me feel hopeless. Techniques used were easy to use and felt very natural. They took time to watch our dogs' behaviors and took time with us to explain the reasons why. Very nice and knowledgeable couple who can relate on a personal level. The charts help to make the training techniques understandable. The attention exercise was very effective and I am especially happy with the technique used when someone comes to the door.It was a very productive session. What we most appreciate about our trainers, Jim and Lorie, is how positive and encouraging they always are. Excellent! I'm so glad we did this! The trainers wer patient, clear and sympathetic to our situation. By the third day of training all 4 dogs were an order of magnitude better and the whole house was calmer. It is a lot of work with 4 dogs but the training works!! It is night and day better in our home and we just got started. Thank you Jim and Lorie! Jim and Lorie are very dedicated to teaching you and your pet! They are comforting yet effective in their knowledge. Logical approach. TI was amazed by the immediate change in our dog. Thanks. Jim and Lorie were great at explaining the techniques and would show or explain the techniques again if i didn't understand.My dogs began to listen to me and seemed more calm.It really works and it is a nice way to train your dogs.I enjoyed every moment of it, especially when I saw my dogs change. We found everything well explained and tailored to our needs.The dogs responded quickly, particularly to the leash work. The dogs love the training so we do too. I have referred Bark Busters already and used the techniques on other dogs with good results. My dog is improving with every session. I am very pleased with his progress.The trainers are very patient and well informed and willing to work with you and your dog. Very excellent process!The approach worked well. Very knowledgeable trainers with good anecdotal information. The information given to us helped us to understand how to think like a dog.We are already sharing new things we have learned with our friends. Jim and Lorie have been very helpful. They have been very good about letting us call them to talk about situations that have arisen since our first meeting. The techniques are simple and very effective.We have enjoyed using them and observing our dog's reactions. The results were almost immediate. It is amazing. This is a lifetime investment in the behavior of our pet. it will make everyone's life happier. Jim and Lorie were very generous with their time and patience. I liked their anecdotal examples as dog owners themselves. We and our dog were more relaxed. The training relieved a lot of my anxieties about whether I had a teachable dog. The techniques make so much sense! We are extremely appreciative of the time and genuine interest given to our problems. They seem to already be detecting a change in the hierarchy beginning to happen. The flip chart kept us focused and on track.Our dog seemed to have an epiphany . Major behavioral changes were the result. Your program did an excellent job of retraining us! It is amazing how smart we got ion two hours. Well worth the investment. The easel with text and images was really helpful.Bark Busters natural training techniques are very interesting. They make perfect sense when you think about it. our dogs have many issues and we know it will take time to get major results. We're excited to start the training and to relate to our dogs differently.